After this statement was released the first lady decided to visit the children that were begin held in detainment camps away from their parents at the border. When getting off the plane to the detainment camps, Trump wore a jacket that stirred up some controversy. On the back of the Zara jacket, it said "I don' t really care. Do you?" Was the jacket something that she threw on last minute or was she trying to send the world a message? Does she really even care about the children being separated from there families or was she just trolling her husband? The media was not buying this explanation and neither were thousands of people on social media. 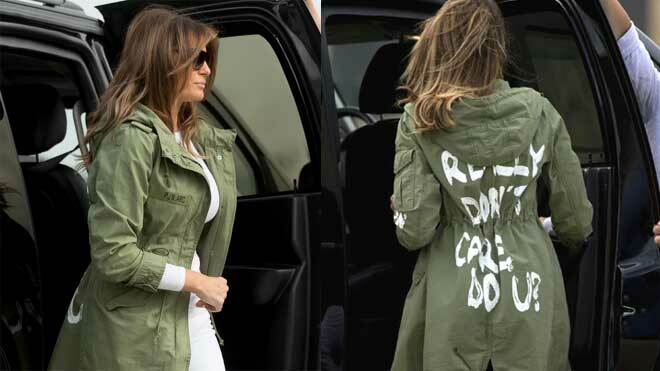 Some people are taking the jacket literally and think she really doesn’t care about the migrant children she was traveling to meet. She may have been trolling her husband about their marriage. What do you think the first lady was trying to say with her jacket? Do you think it was a big deal? Let us know in the comments section below.